Some experts claim that e-democracy in Ukraine is making progress supported by current demographic, technological, and political trends. However, as recent research reveals, perception of the digitization of governance processes in Ukraine differs between different stakeholder groups. The workshop is open to the public – please register at ue.rhicnull@tneve. During the workshop, Dr. Khutkyy will present new research findings about e-democracy in Ukraine. He will demonstrate the differences in the perceptions of six stakeholder groups —government, civil society, media, business, youth and academia. His findings show that most common form of e-governance is simply information, while e-democracy is mostly channeled via e-petitions. At the same time, only one quarter of the population is aware of the existence of e-petitions, according to a nationwide survey conducted by Ukraine’s Razumkov Center in November 2015. 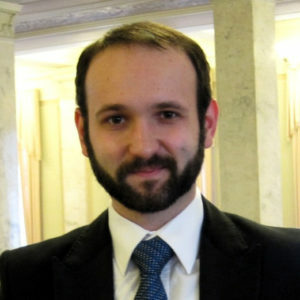 Dmytro Khutkyy is a public sociologist and activist at the E-Democracy Group and Reanimation Package of Reforms in Ukraine. He leads applied research teams for both the educational startup GoIT as well as the Center for Innovations Development (part of National University of “Kyiv-Mohyla Academy”). He also conducts academic research at the Institute for Research on World-Systems, at the University of California-Riverside, USA. Khutkyy obtained his doctoral degree in Sociology from the Institute of Sociology of the National Academy of Sciences of Ukraine. He has completed several international research programs, including the Erasmus Mundus EMERGE Program in Germany, the Carnegie Research Program and the Fulbright Faculty Development Program. To understand how global human rights challenges of the digital age, we need to know more how Internet policies are developed at the national level. We think it is particularly important to research internet policies in countries, which are at the borders of large geopolitical systems. At the periphery of the global system, internet policy is often not so strongly institutionalised as a result of which human rights norms are more in flux. In this project, we want to take a closer look at internet polices in the Eastern Partnership countries. Eastern Partnership countries are Armenia, Azerbaijan, Belarus, Georgia, Moldova, and Ukraine. Torn between two large geopolitical block, those six countries are very vulnerable to the growing mistrust between Brussels and Moscow. Strong trade and investment links to both Russia and Europe force them to make decisions, which can be politically hard and economically costly. Internet policy is one of the areas most affected by competing human rights discourses and trade interests. Read more about the IPEP16 research project and the prior IPEP16 workshop in March. Follow the discussion on Twitter at #IPEP16.